Indian Institute of Management Raipur organized the 5thAakash Entrepreneurs meet on 16th August. 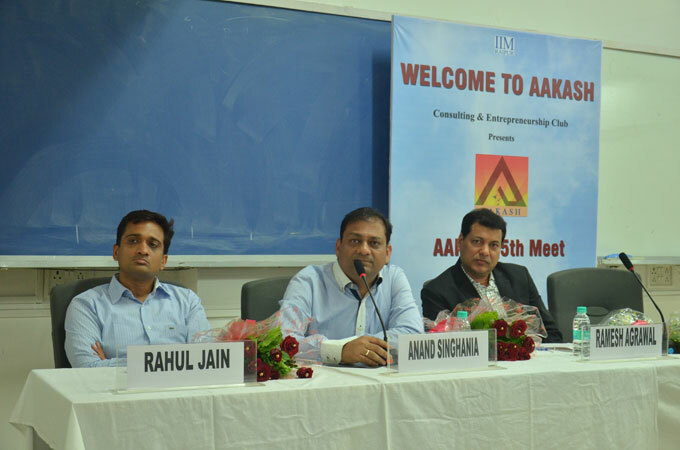 Conceptualized and executed by the Consulting and Entrepreneurship Club, IIM Raipur, the 5th Aakash meet saw the presence of 3 successful entrepreneurs from Raipur itself. Mr. Anand Singhania, MD, Avinash Group - Builders & Developers, Mr. Ramesh Agrawal, Director, Real Ispat / GK TMT Group and Mr. Rahul Jain, Director, Sambhav Group & President- Rotary Club of Raipur Cosmopolitan were welcomed by Dr. Sanjeev Prashar, Chairman, Consulting and Entrepreneurship Club. The dignitaries addressed and interacted with the gathering of the IIM students and 10 other entrepreneurs from Raipur. Mr. Rahul Jain highlighted the importance of believing in your idea and illustrated his point with an impactful video. He shared his experience about his struggle to enter the textile industry and establisha successful business. He further pointed out that ‘Happiness is Success’and urged the students and other entrepreneurs to give back to the society in every manner they can. Mr. Anand Singhania gave some key points necessary to become a successful entrepreneur. He said that entrepreneurs should have the ability to talk to themselves and should try to develop a positive thought process. He emphasized the importance of being a good learner and gave examples from his life where his learnings had helped him grow. He shared with the gathering his original idea which had transformed the way the business was done in malls during the week day. He ended his address with the words ‘learn to love what you do’. Mr. Ramesh Agrawal began his address with an important message that it is the vision followed by the action that changes the world. He used several videos during his address to express his views and thoughts. According to him, when you have faith in something, and want it with all your heart, then you unconsciously take the necessary actions to accomplish it. He further mentioned the challenges that an entrepreneur has to face in business and day to day life and how he overcame those. He specifically emphasized on maintaining good human relations throughout the life. Afterwards there was a networking session where the entrepreneurs interacted with each other andtook questions from the students. The students raised several pertinent questions about starting and maintaining a new business. 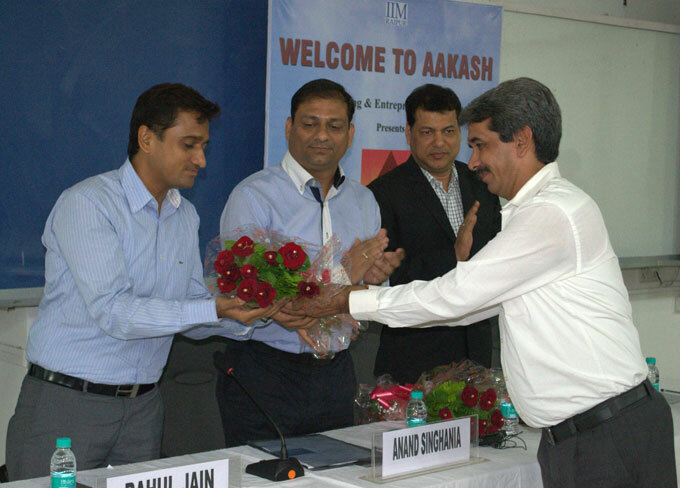 The Aakash meet comes as the latest in a long string of achievements by IIM Raipur in recent times.